In 2049 the human race is on the brink of extinction. The fertility rate has plummeted and one of the ways that humanity has held off chaos is by creating perfect android children that are used as substitutes to raising real children. They are raised and loved but at age eighteen they are returned to the factory, never to be seen again. Tania Deeley is a teenage girl who knows that she’s one of the very rare real humans in her school. She never really questions how the android kids are treated because she’s just trying to survive being a teenager in a world unlike the one her parents grew up in. When a freak accident opens her eyes to the deception being played out around her, she joins the fight to determine what humanity really means. 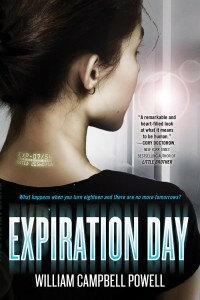 Expiration Day was an interesting read. Taking place in a very un-dystopian dystopia, it treads some of the same ground that Asimov did in his robot stories – what makes a person human, and where does that line get drawn? Mainly along the periphery do we ever see what’s happening in the world outside Tania’s limited perspective, but those details inform how the characters live their lives. Not only is this a good story, but there are unexpected twists and turns along the way that don’t seem forced, and the ending, although seemingly foreshadowed, ends up somewhere else completely. This is a standalone book that could potentially have a sequel, but the main storyline was satisfyingly (if not a little speedily) wrapped up, so there aren’t any cliffhangers.